Random House Books for Young Readers, 9780375870569, 40pp. There's no other horse quite like Calliope. She's short. She's slow. She's lumpy. She's a rhinoceros. Still, Cowboy Boyd has a real strong belief in Calliope and her ability to help out the crew at the Double R Ranch. Boyd and Calliope try to prove themselves to the ranchers by rounding up strays and hauling posts, but it just doesn't look like it's going to work out. That is, until a storm drives all the cattle away from the ranch. 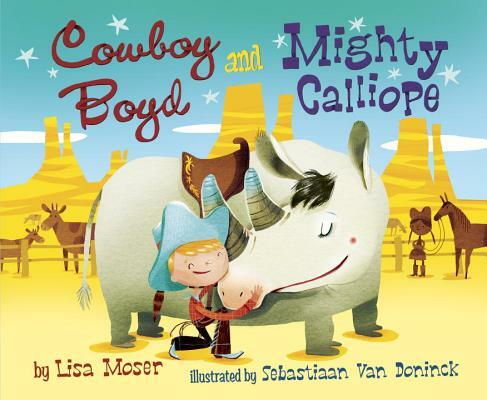 They need someone real special to bring them back. . . .
Lisa Moser brings her trademark humor and strong structure to this smart and silly story of a cowboy and his beloved steed—a rhinoceros. LISA MOSER is the author of Squirrel's World, which is on the 2010-2011 Texas Bluebonnet Master List; "The Monster in the Backpack; Watermelon Wishes; Kisses on the Wind, " which received an Oppenheimer Toy Gold Seal; "Perfect Soup; and Railroad Hank." She lives in Wisconsin with her husband, Marty, and their daughter, Lydia. SEBASTIAAN VAN DONINCK grew up in a small town surrounded by cows, trees, and twelve brothers and sisters. Today he is an illustrator and teacher living in Antwerp, Belgium. Starred Review, Kirkus Reviews, June 1, 2013:"A ten-gallon hat full of fun, with a heartfelt message to boot."